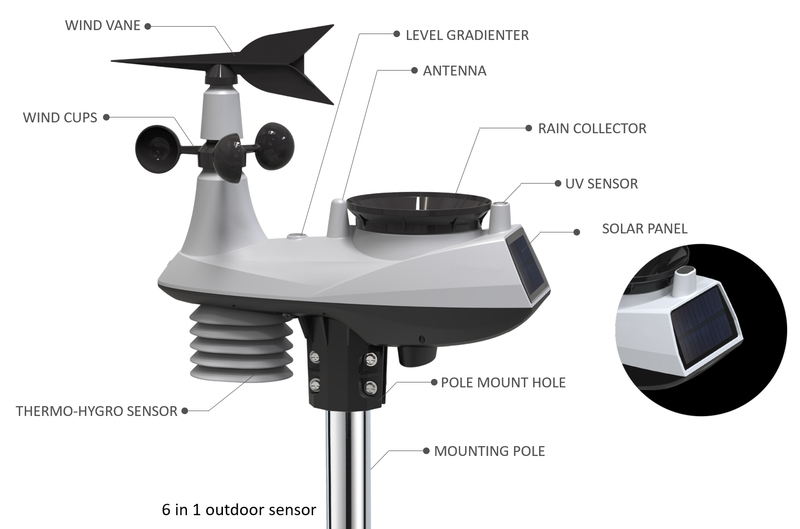 The 6-in-1 WIFI professional weather station by BRESSER offers comprehensive opportunities to control your local weather information via smartphone. Due to the WIFI connection it is possible to check your local weather information from home or on one's way. The information of the multifunctional sensor will be transferred to the mobil App of Weather Underground so that you can check the information of temperature, wind speed, humidity and precipitation. The mobil app is well structured so that the usage is rather simple. Furthermore, we have to highlight the measurements of the air pressure and UV rays. The measurement of the UV rays is enormous useful because it gives detailed information about the necessity UV protection. Additional, a hyetometer provides information about the amount of precipitation. The very compact and multifunctional outdoor sensor requires only little space and thus can be placed almost anywhere. A pipe clamp and screws for the attachment at poles (pipe diameter of about 25-33 mm) are already included. The power supply of the base station is set up by a 5 V DC connector. The multifunctional sensor requires three 1.5 V batteries. The solar panel is necessary for the emergency power supply. Moreover, the connection status between the base station and the sensor is shown by a small LED lamp. 1 Batteries user supplied, unless not content of delivery.